When my friend and fellow thrifter Elisabeth of 365 Days of Thrift asked if I wanted to collaborate together on an editorial type photo shoot, I obviously jumped excitedly at the chance. Elisabeth and I both share a love for the wilder side of fashion so I knew this project would be inspiring creatively for the both of us. Elisabeth shared some thoughts and ideas for the photos she had in mind (she is an amazing stylist as well!) and I started doing what I do best, being as extra as possible. 😉 I came up with some outfit ideas and the photos that resulted from our collaboration are nothing less than magical! Elisabeth outdid herself with these photographs! The angles and colors compliment my styling so well and I am so grateful to have such a talented friend! Elisabeth graciously put up an interview with me along with the amazing photographs she took on her blog! She definitely gave me some tough questions to answer. I have shared a few of my answers to her questions below, but visit her blog, 365 Days of Thrift, to read all the answers! All clothing from Goodwill, UAL, and Buffalo Exchange! 1. Why is style so important? Whether we want to admit it or not, a lot of things in our lives hinge on style. A job interview, a first impression from a new friend, networking/making connections, how customers/clients perceive us and the list goes on and on. Style is important because it is a way to express who we are and what we want to be without ever uttering a word. So if clothing and style is such a huge part of all our lives so why not make it fun? It shouldn’t be some horrible task you have to conquer every morning. No matter your style or clothing you choose to wear as long as you stay true to yourself and who you want to be, that is all that matters. 2. Best thrift find and why? So many pieces I could choose from! I think my favorite piece, if I had to choose, is a pair of navy blue pinstripe vintage Saint Laurent pants that fit me like they were made for me. I love thrifting so much, but I also have such a huge appreciation for high end design. It was really amazing to have the two collide and stumble upon such a cool piece that happened to fit me perfectly! 3.Why do you thrift? Why should everyone else thrift? Two main reasons for me. 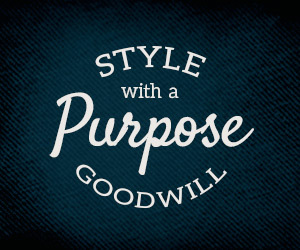 Number 1: I thrift because it benefits the environment and the world we live in. It is a form of recycling and one of the only reason things end up in a landfill for thousands of years is because we always insist on buying something new versus taking someone else’s trash and making it our treasure. Number 2: I love unique pieces. I mean something so unique that no one else around me will ever have it. One of my main ways of finding these unique pieces is through thrifting! Some of the most unique pieces I have came from a thrift store and I spent almost nothing for them. It makes me laugh when someone asks me if a vintage/thrifted piece is a particular high end designer. It always shocks them when I relay what it is and where I bought it. If they can’t tell the difference, then no one else can either! It is all about how you style the pieces that you have and the confidence you possess when you wear it. 4. What lesson have you learned in life that you most want to pass along to others? Don’t care what other people think about you! I know this is difficult at times, but you can’t spend your entire life not doing what you want or stepping out of your comfort zone because someone else might think it’s weird. People will always make fun of what they do not understand. Most of these people are narrow minded and if you desire to grow and be different than the average person then you have to learn to disregard what they think and say. This takes time, but it is the most freeing feeling in the world to do what you love and not care a bit what anyone else thinks about it.